You see glass everywhere. Your windows, your drinking vessels, your smartphone. Now you can too can manipulate this material to make a microscope completely from scratch. Forge a ball lens, see worlds previously unknown, and join the ranks of scientists who have assembled their own instruments. You will learn the history of the microscope's development in Northern Europe during the Enlightenment and the physics of how balls lenses function. You will learn how to manipulate glass into a simple lens. You will also learn, because of a material's index of refraction, why a ball of glass works as a magnifying lens, but a ball of diamond does not. You are starting from zero. You are beginning the field of microscopy. There are no previous experiments to do. In grade school you are taught that your body is composed of individual "lives" called cells. Your heart, your muscles, your brain, your stomach, and almost all the parts of your body are made up of the trillions of cells that are you. Perhaps you have even seen some examples of these cells from our previous Backyard Brains experiments or experiments in your school. You may have also heard from your loved ones to wash your hands because of indivisible little things called "germs." The existence of cells and microscopic life is common knowledge as it should be. But there was a time when this was not common knowledge. There was a time when such was the very edge of science. This time was the 1660s and 1670s in England and Holland with work done by two scientists - Robert Hooke and Antonie Philips van Leeuwenhoek. In 1664, a 29-year-old Robert Hooke was commissioned by the Royal Society of England to write and publish "Micrografia – Or some Physiological Descriptions of the Minute Bodies Made by Magnifying Glasses With Observations and Inquiries Thereupon." Using a compound microscope (two lenses - a condenser and an objective), he made a famous observation of a slice of cork, showing that the tissue of the plant was made up of individual elements he called "cells," after their appearance to the cells of bee honeycombs. Robert Hooke was an excellent inventor and polymath. He is indeed the Hooke of "Hooke's Law" concerning the force on springs, and he did important work along with Galileo and Huygens verifying the rings of Saturn. As far as we know, he moved on to other investigations after he published Micrografia and did not turn to further investigating the microworld. However, across the English Channel, in the nation of Holland, a successful clothing vendor in Delft began cultivating an interest in optics. He fabricated small glass spheres and developed a metal casing for the spheres in a deceptively simple and elegant design for viewing samples at different angles by changing the position of various screws. 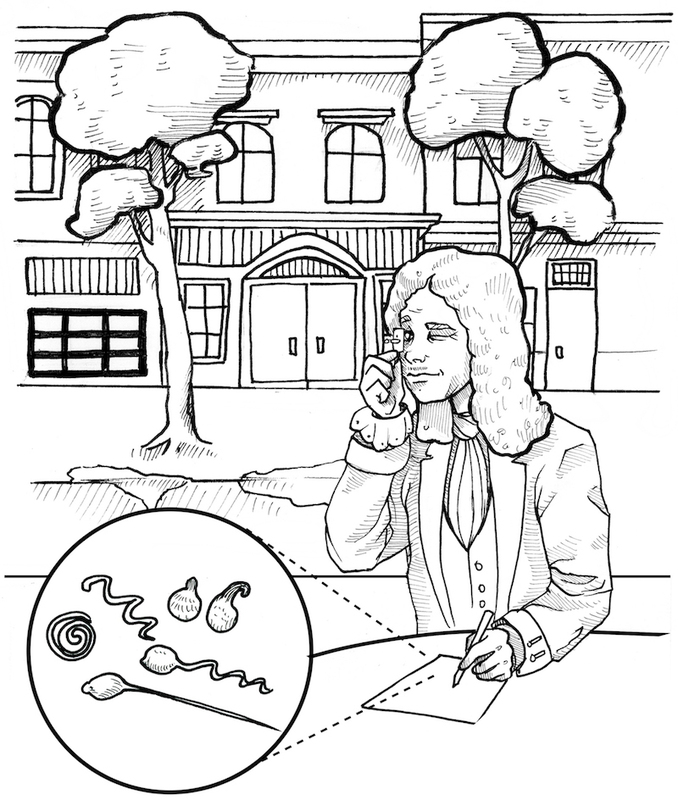 Leeuwenhoek would stare at samples through the sphere in bright daylight, and, one day beginning in 1674, viewing a drop of pond water, he observed things moving which he called "animalcules." This was the first documented view of the living microworld, that there are living things in the world that our naked eyes cannot see, but with the invention of magnifying tools, we can. He also did an experiment observing bacteria on scum on his teeth, which were not present after he drank hot coffee (supposedly killing/removing the bacteria). He did "organism-culture" experiments with pepper grains to determine the origin of the animalcules. While he never formally published his findings in monographs or books, he communicated his observations in many letters written in Dutch to the Royal Society in England, which are stilled preserved and archived in London. We at Backyard Brains are certainly fans of scientists who are excellent tool builders, which is one of the reasons we study Leeuwenhoek here. But let's take a step back. How does a lens work? Moreover, what is even a lens? A lens has three properties, it is clear, it is curved, and it bends light. The bending of the light is the key property that allows microscopes to magnify images. 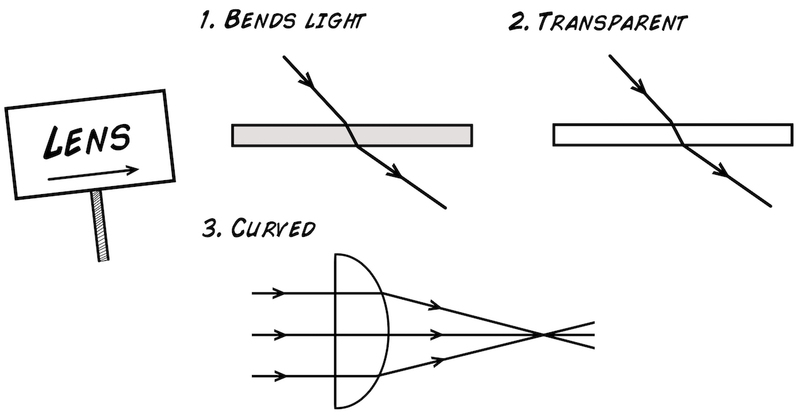 Light bends when it enters or exits transparent material at an angle, and the curved form of a lens allows the bending to either "diverge out" or "converge in" depending on the shape of the lens. The bending property is actually due to the speed of light. We often think of the speed of light as a constant that can never be surpassed, but light actually travels at different velocities depending on the material in which it is passing through. Because of this difference in speed of light between two materials, and given light's peculiarities, when a ray of light, traveling in vacuum or air, encounters a new material, the angle will change so that light "spends less time" in the material. This level of bending is defined as an "index of refraction." Conceptually, we can think of a famous example where a runner must cross a stream to reach a table of donuts. 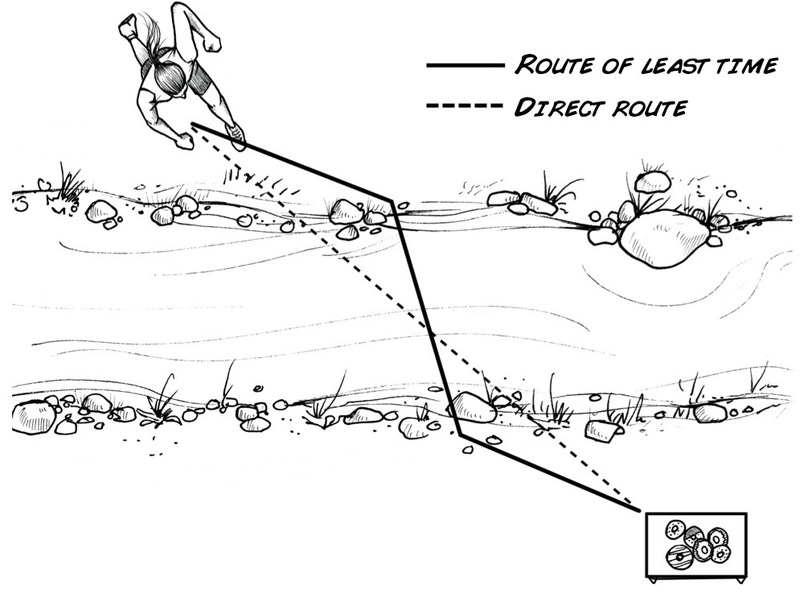 The direct route is actually slower, since running in water reduces the runner's speed. Thus the runner actually takes the "least time route," in which she changes the angles where she enters the water and exits the water to reach the donuts in the fastest time possible. This "time minimization" serves as an analogy as to why light bends when entering a material. 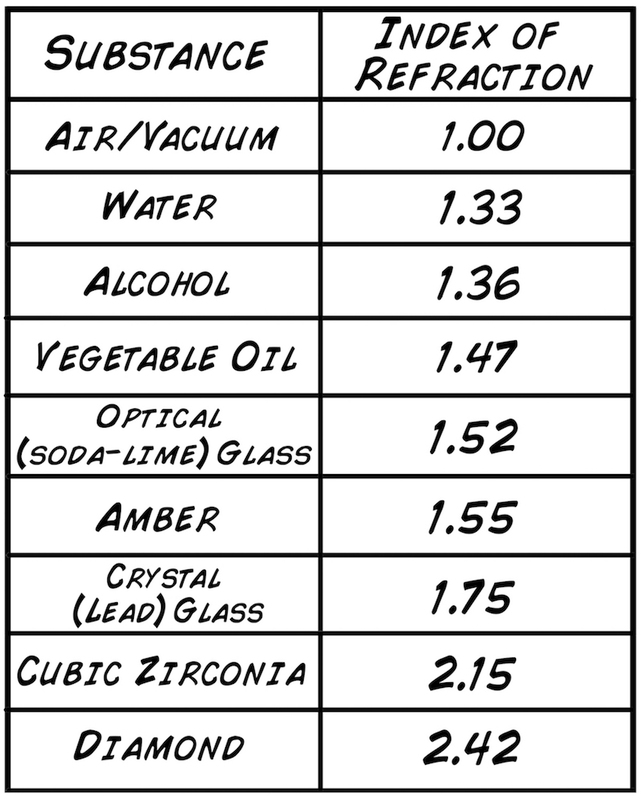 and the higher a material's index of refraction, the more the light ray bends. This mathematical relationship of the changing angles between two materials was first derived geometrically by the Persian/Baghdad scholar Ibn Sahl in the 10th century. Sahl was interested in the geometry of "burning mirrors and lenses" that can converge light rays from the sun to allow localized increases in temperature and flames. The law was then independently discovered again by Willebrord Snellius in Leiden in Holland in the early 17th century. Science history recognizes it the equation above as Snell's law, though it was known during the Islamic Golden age by Ibn Sahl and the famous optics theorist Ibn al-Haytham. 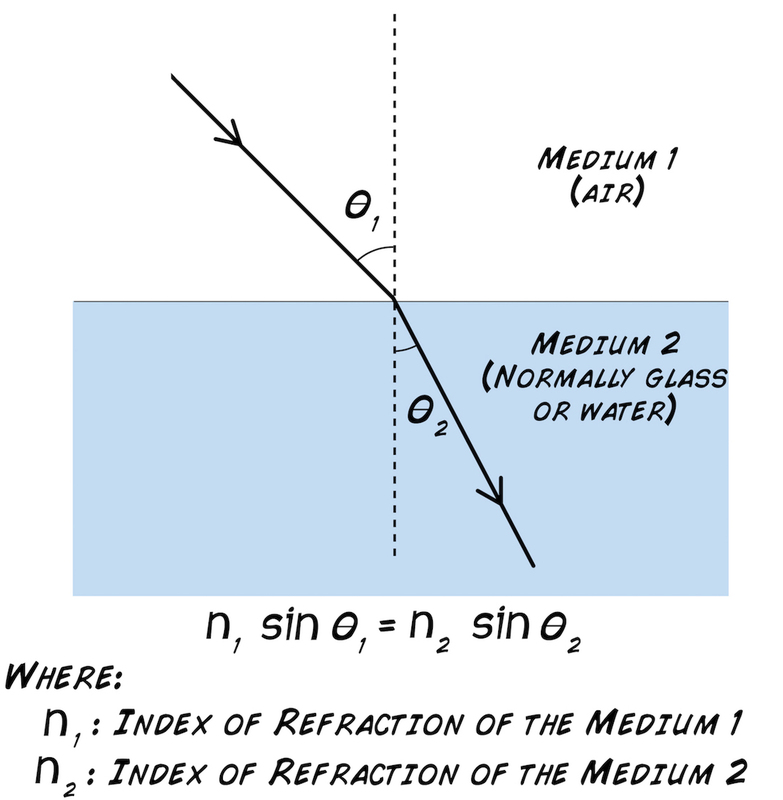 With just this simple index of refraction equation, you can calculate how lenses behave. Remember that a lens needs be curved. With this curvature, you can cause light rays to diverge or converge. Let's look at the simplest example, a ball lens. 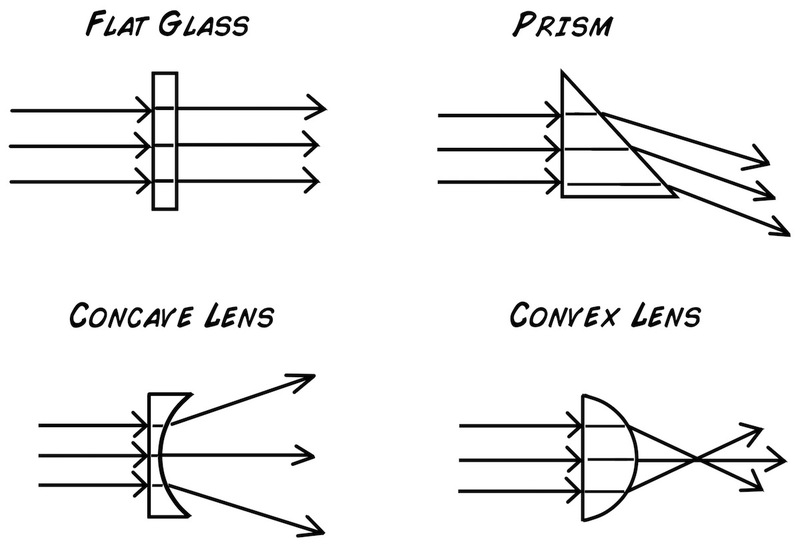 Note that the curvature of lens deflects the ray of light more than if it were simple flat piece of glass. The curvature causes an image to focus at some distance away from the lens, or the effective focal length. 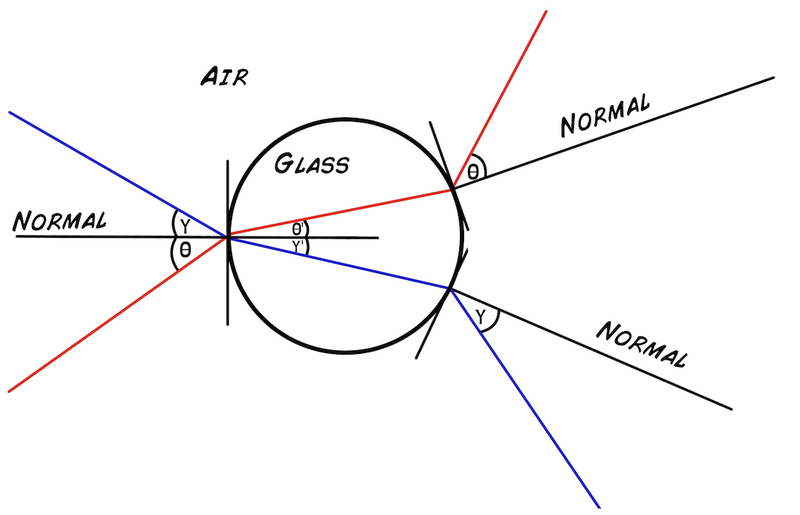 Optics is all geometry, and the equation for calculating focal length based on the geometrical bending only requires we only know the diameter of the sphere (d) and the index of refraction of the material the sphere is made out of (n). But, you may ask, how does the lens actually enlarge the image and cause the magnification. See the image below, and you will recognize, again, why the curvature of the lens is the fundamental key. 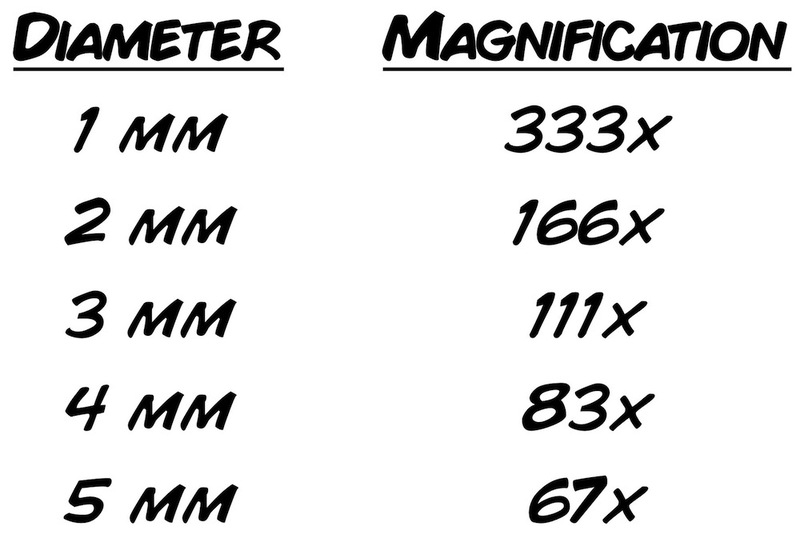 As you decrease the size of the lens, you increase the magnification more and more! The caveat is that the focal length, for glass, starts becoming unmanageable around 1 mm in diameter. 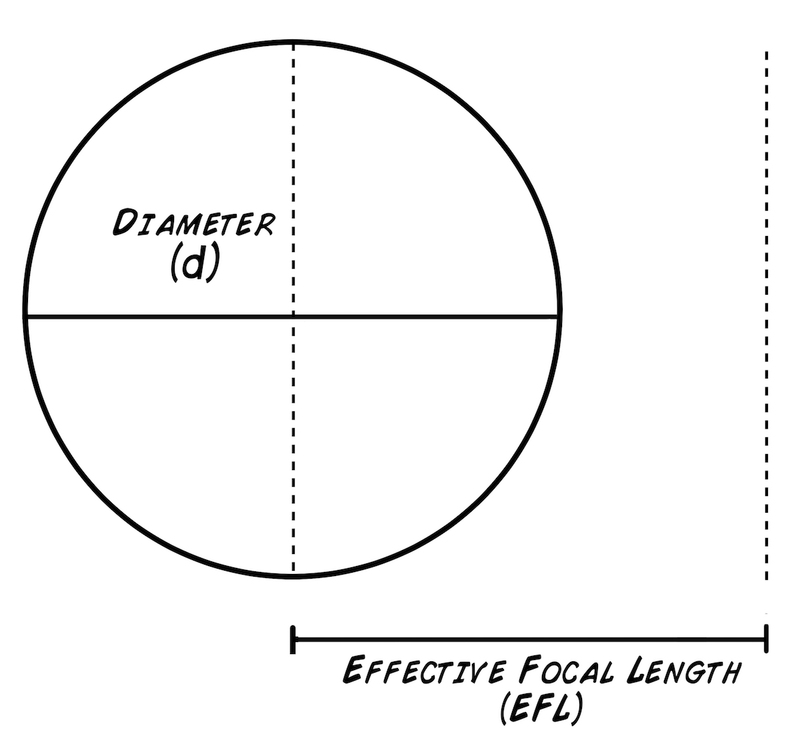 The focal length for 1 mm diameter glass sphere lens is 0.75 from the center of the sphere, or 0.25 mm outside the lens. This 0.25 mm focus is creeping into the thickness of cover slip glass (~0.2 mm), and it will appear you will never be able to focus your sample. At 2 mm diameter lens, the focal length is 0.5 mm outside the lens, more manageable, and at 5 mm, you have a comfortable 1.25 mm focus outside the edge of the sphere. Of course, you magnification is less. Now enough with such lovely history and theory, let's step away from our magic glass screens where we read of the accomplishments of others and build something of our own. We will construct a "re-imagination" of Antonie van Leeuwenhoek's microscope by melting clear glass, forming small spheres, and using our eyes to view worlds unseen. A high temperature flame - it can be a camping torch or a crème broûlèe torch. Solid Glass Filament, we use McMaster-Carr borosilicate glass filament but you can try with your own different glass filament, such as crystal glass (higher index of refraction, lower melting point) or soda lime glass (same index of refraction, lower melting point, more susceptible to fracture). Basic Metal Probe tools - we have found dental picks work the best. Basic Needle Noise Pliers, forceps, or a jewelry toolset. Turn on the flame. Respect it. Take a filament of glass, hold it over the flame and pull the filament apart until you get two thin points. Make sure to use solid glass filament, not hollow glass. Take one half of your now two glass pieces, and push the tapered end into the flame until it forms a small spheroid end. With your forceps, break off the spherical end over a flame. 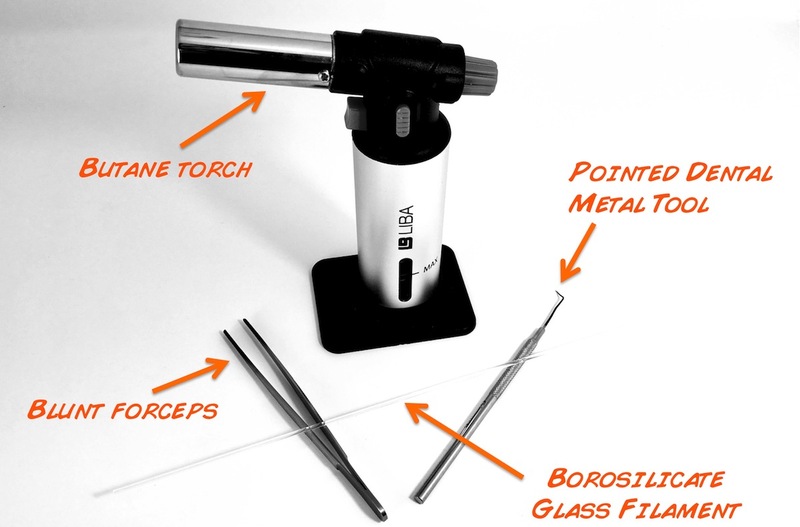 Put your dental probe fine end into your glass bit over the flame. With patience, work the glass spheroid bit with the flame, forming it and forming it, using the heat and gravity as your friend, in your attempt to make a glass sphere. It should be as round as possible and without any bubbles and minimal embedded black residue. Once formed and cooled, please the sphere in a small hole in our 3D printer support (or alternatively a piece of cardboard). 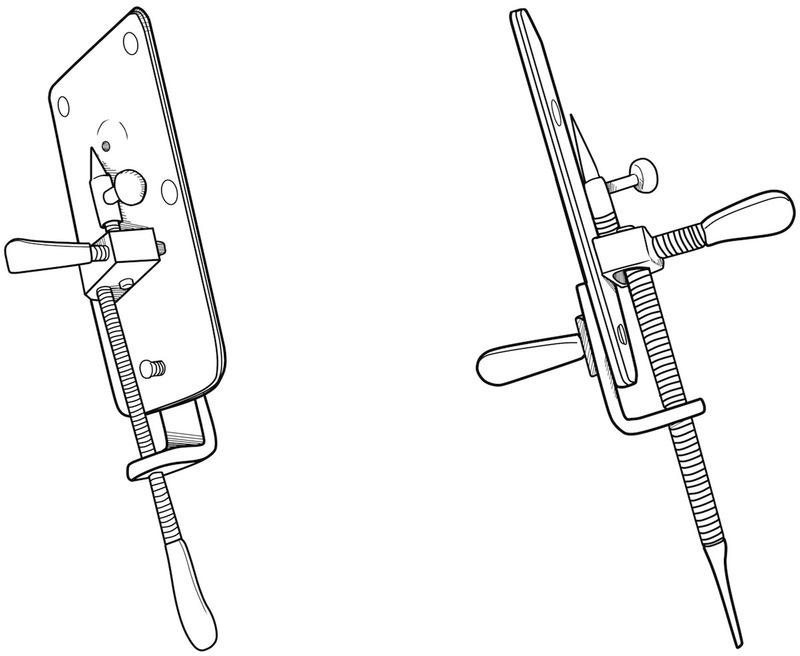 If the the glass sphere doesn't fit, use a small scissor blade to enlarge the hole. Now prepare a slide sample or look for a pre-prepared slide sample. Hunt or Buy an onion. Remove the outer dark skin. Cut the onion in half. With a tweezer, take a bit of clear onion skin. This skin layer is only one cell layer thick! Place the onion sample on a glass slide. You are now ready to look at it with your lens. If you have access to methylene blue, you can also view your skin cheek cells. Scrape the inside of your cheek with a tooth pick. Rub toothpick on glass side. Apply a drop of methylene blue. Soak up excess. 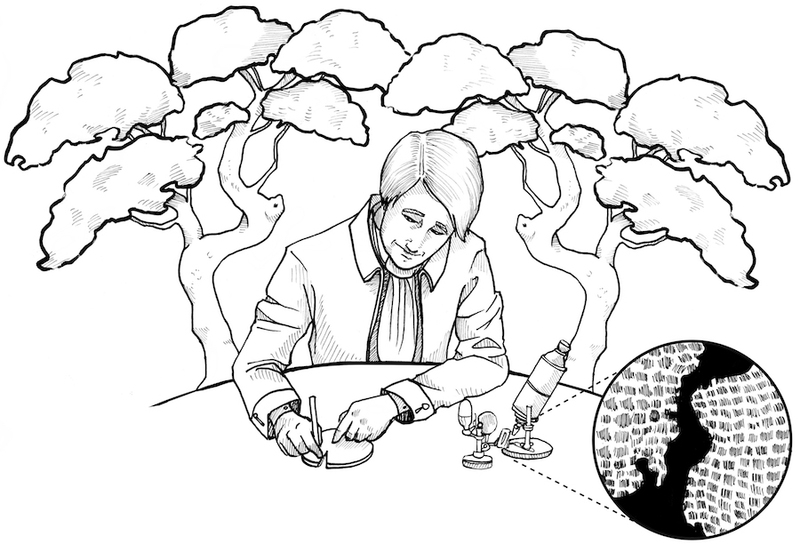 Place the holder with your embedded glass sphere up to your eye, as if you are looking through a ... microscope. Turn on a lamp and look at the lamp through the microscope. You need a light source. Bring your slide up to the other end of the ball lens. Note that the focal length is very short, 0.3-1.0 mm away from the lens. With patience and steady hands, the image should come into focus. Note that your ball lens needs to be at least 1 mm in diameter or greater, otherwise the focal length will be too short and too hard to focus for you. With our LeeuwenScope that you can buy or build, place your plastic holder with its ball lens in the support stand on the LeeuwenScope. Place your smartphone over the lens. Focus sample by turning the focus knobs. The depth of field is very narrow on ball lenses. Sample should come into focus on your smartphone, and you should be able to take a picture. Now find some pond water and see what Leeuwenhoek also saw! The greener the water, the better, and if there is plant debris is the water sample, even more so! 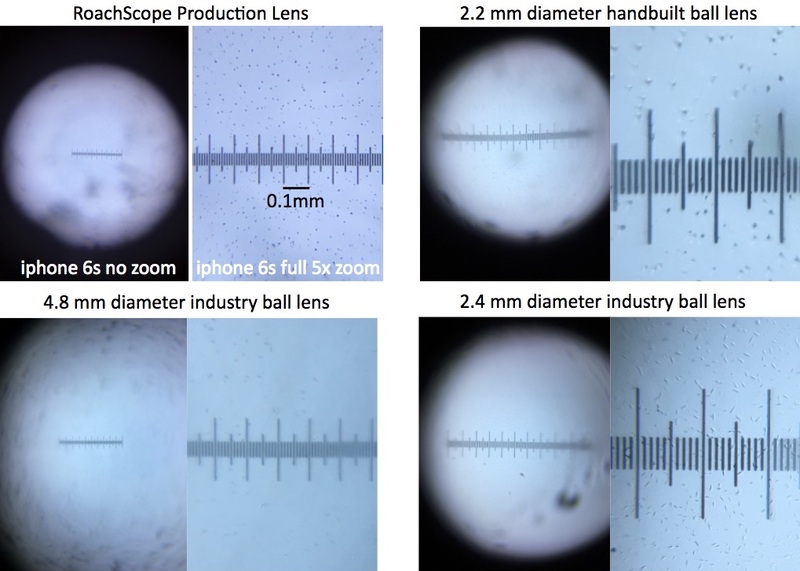 How is the quality of your ball lens compared to our industry ball lens and our RoachScope? See image comparison below. Happy exploring the previously invisible worlds! You can see the microscope that Robert Hooke used for his studies at the National Museum of Health and Medicine in Washington, D.C. as part of an exhibition - The Evolution of the Microscope. Scans of Hooke's gorgeously drawn book are available online. Leeuwenhoek's microscope are rare (only 11 verified microscopes survive to date), and most museum exhibitions only show replicas. But...if you want to see original Leeuwenhoek microscopes, your road leads to the Boerhaave Museum in Leiden, the Netherlands. We have heard rumors that another is stored at the Delft University of Technology. Scans of Leeuwenhoek's letters to the Royal Society are available online. If you want to visit the resting places of the scientists mentioned here, Antonie van Leeuwenhoek is buried at the "Oude Kerk" (Old Church) in the small town of Delft. Willebrord Snellius is buried at the Pieterskerk church in Leiden. The resting places of Robert Hooke and Ibn Sahl, to our knowledge, are unknown and have been lost to history. The recent re-make of Cosmos, hosted by Neil Dygrass Tyson, has an episode talking about Ibn al-Haytham's work, who was a contemporary of Ibn Sahl. Go to time mark 8:20 of episode 5 "Hiding in the Light" (available on Netflix and iTunes). If you want to dive into the original text and understand how Ibn Sahl derived the "Sahl's Law" (Snell's Law), you can read French scholar Roshdi Rashed's extensive examination of Ibn Sahl's original Arabic text. Paul de Kruif's famous 1926 book The Microbe Hunters has an excellent early chapter on Leeuwenhoek. Unfortunately the later chapters on 19th century disease science propagate racial stereotypes of the epoch. It is easier to make microscopes out of glass than out of mirrors, and it is easier to make telescopes out of mirrors than glass. Why is this? Think about the sizes and weights involved. It is interesting to think that light travels 2.6x less when it is traveling through diamond, with its index of refraction of 2.6. Could we imagine a material with an infinite index of refraction? A Black Hole? Can we imagine a science fiction world with indices of refraction less than 1, or, gasp, less than zero? How Leeuwenhoek built his microscope is still unknown and only hypothesized as he never revealed his techniques, typical of scientists of his day (as Galileo also never revealed how he built his telescopes). They were not very open-source, but we try. Why did it take until the enlightenment for Europe to invent the microscope and telescope? A historical examination into the development of glass shaping techniques would be a valuable endeavor. The Venetians made advancements in shaping glass and mirrors in the 1300s-1400s, which they militantly kept a trade secret. Glass had been manipulated since antiquity (Romans), but it appears glass clear enough to be used as corrective eyeglasses occurred in the 1300s in Italy. The first European telescopes were invented in Holland in 1608 by Hans Lippershey. Why you think it took so long between eye glasses and telescopes? If you can make eye glasses, you are almost there.....Our hypothesis is that truly "clear" glass was difficult to manufacture until the 17th century, and optic theory was still not understood well. This project was developed in collaboration with biologist Daniela Flores of the Chilean science outreach group MicroMundo. John N. Davis. 2007. Measuring the magnification of homemade simple microscope lenses. Micscape magazine. Edmund Optics. Understanding Ball Lenses. Roshdi Rashed. 1990. A pioneer in anaclastics: Ibn Sahl on burning mirrors and lenses. Isis, Vol. 81, No. 3. pp. 464-491. Lesley Robertson. 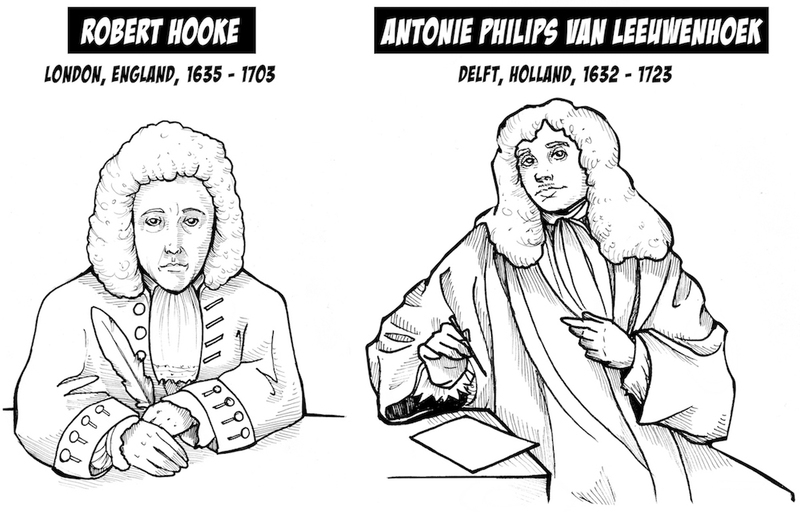 2015. van Leeuwenhoek microscopes—where are they now? FEMS Microbiology Letters, 362, 2015, fnv056. Maria Rooseboom. 1939. Concerning the optical qualities of some microscopes made by leeuwenhoek. Journal of Microscopy. Vol 59,3, Pgs 177–183.